This is what's in the kitchen sink right now. Over the weekend the dishwasher decided to stop taking in water, meaning it doesn't work. That's so nice when we'll be turning over the house in a week and a half. My brother, B, said he'd take a look at it. Who knows we might need a new one. Anyone know of a good deal on an inexpensive dishwasher? Meanwhile I get to do the dishes by hand. Love that. Last night Mickey dried while I washed. That makes it a lot more tolerable and we got done quickly. And since work needed to be done the kids disappeared. Okay they were really outside running around waiting to take Meg to practice. We enjoyed the quiet. Just after noon and the POTD has already been posted? Now that's efficient! I needed a break from packing. POTD? 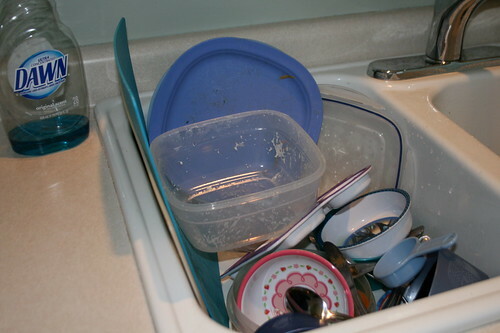 Also, dishes are my nemesis. Give me laundry any day. B fixed it! We were too dumb to realize a spoon was stuck under the float, holding it up so no water would go in, thinking it was already full.